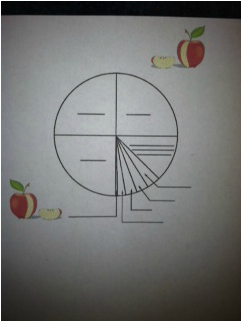 Sample of Apple Graphs - Fun With Science! Graph Borrowed from Population Connection Presentation. 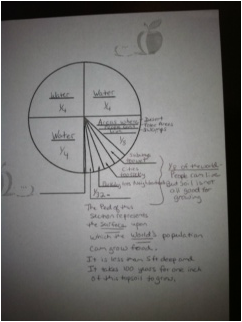 3/4 represents the portion of earth covered with water- Set these aside. Cut 1/4 in half. One of the pieces which equals 1/8 of the whole apple represents the areas where people can't live: the polar areas, deserts, swamps, and very high or rocky mountains.Put it aside. These 3/32 represent areas of the earth that are too rocky, too wet, too cold, or too steep. the other portion of this 3/32 represents land with a low soil quality. These sections also contain highways, neighborhoods, communities, and cities. Put these 3 pieces aside. Take the remaining 1/32 and peel this slice. The skin of this 1/32 represents the amount of fertile land on earth. This very thin layer represents the very thin layer of Earth that we can grow food in. It is less then 5 feet deep. It takes 100 years for 1 inch of topsoil to be replenished.